Valentine open house. Easy Valentine Day party. Valentine’s Day--a favorite for some; not so for others. But you can make it everyone’s favorite if you decide to celebrate and invite your friends—single, divorced, hooked up and not! There’s a little Cupid in everyone! Or invite just your special someone. You decide. Personalize Your Party! 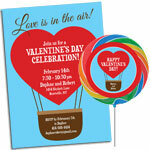 Send out a personalized Love is in the Air Invitation to get your guests in the mood (to party that is)! Add a few plastic rose petals in the envelope. You can spritz some flowery perfume on them so they give the invitations a nice smell. Come have a sweet time at our Valentine's Day Open House! Make sure to send your invites out 6-8 weeks in advance, so you make it onto everyone's social calendar! Welcome guests with a fun activity. Scatter children's Valentines on a table along with a few pens and let guests leave messages to you, or to each other. Or make an oversized Valentine's Day card and have everyone sign it like a guestbook. Conversation hearts make great confetti, so scatter them on top of your tables! Red roses are perfect for Valentine's Day but they are so pricy at this time of year! Fluffy carnations make great substitutes. Or make bunches of tissue paper flowers. Personalize Your Party! Place a personalized life-sized "Love Struck" Cutout with your face or that of your special someone with a speech bubble sending hugs and kisses to all. Outside or in, a Personalized Valentine's Day Banner is the perfect choice to welcome all. Many to choose from; my favorite is the Letter Valentine Banner (with your Valentine listed for all to see). Heart Shaped Valentine's Balloons are available at any local party store and match your party perfectly. Use red tableware for dinner and dessert plates, napkins, cups, table covers and cutlery instead of washing silverware (of course). Use flowers as your centerpiece and add twinkle lights for a cool special effect. Set out a plate of candy for all to share, and scatter Hershey Kisses at each place. Decorate the buffet and bar with red tablecovers, and sprinkle a few more heart gems and rose petals around the dishes. Personalize Your Party! Send everyone home with a Personalized Chocolate Candy Bar, and they never will forget what a SWEET time they had at your Valentine's Day party! Pass out fun heart themed favors to all of your guests. You hand out favors at the end of the party, but these treats are so fun that I would pass them out at the start for everyone to enjoy! Make it extra special and throw them in these personalized Valentine's Day Favor Bags. Check out our custom Valentine's Day Lollipops for a unique party favor! Love will be in the air at your party if you follow our advice! Happy Valentine's Day from Party411.com!